Leonardo DiCaprio just closed a seven-figure deal with Paramount to play Leonardo da Vinci in an upcoming high-profile biopic, Deadline has confirmed. The studio was reportedly in a “furious” battle with Universal over the rights to Walter Isaacson’s upcoming book Leonardo da Vinci, set for release this October, since DiCaprio was interested in the material as a potential starring vehicle. (Isaacson’s biographies of Steve Jobs and Albert Einstein have also recently been adapted for the screen.) The book, according to info from the publisher obtained by Deadline, will use da Vinci’s notebooks to weave a narrative of his life and to explore his profound artistic and scientific curiosities. 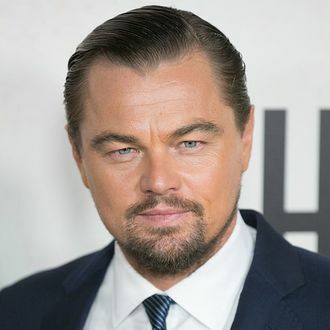 DiCaprio was named by his mother after the legendary painter, and given his previously expressed interest in the role, it’s all but a given that he’ll once again go all-out to prepare. Fortunately, Isaacson’s book will include details about da Vinci’s vegetarianism, which means we can all breathe a sigh of relief knowing that DiCaprio’s attempts at getting into character will, at the very least, not require consumption of raw bison liver.